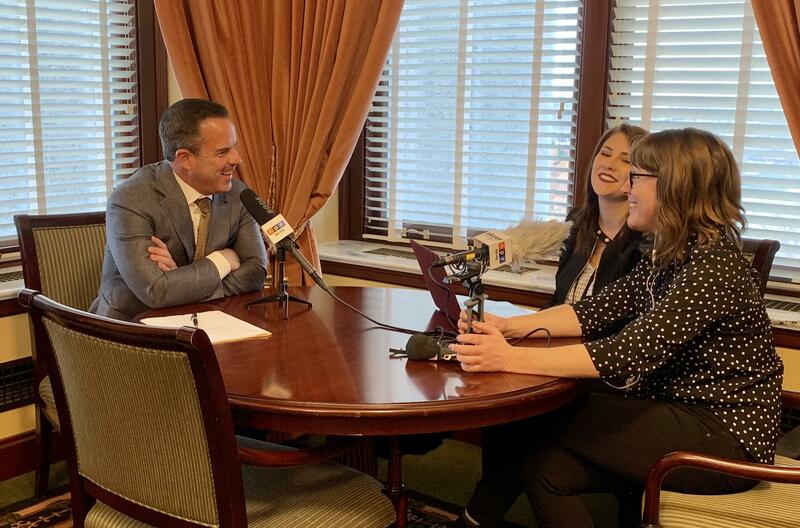 Incoming House Speaker Brad Wilson, R-Kaysville, tried to quell those concerns in an interview with KUER political reporters Julia Ritchey and Nicole Nixon. Wilson says ballot initiatives are “an important part of our democracy,” and while one Republican senator has plans to scale back Prop 3, which expands Medicaid, the new House Speaker plans to extend coverage to everyone. The Kaysville Republican also talked about potential solutions for air quality, another looming debate about the state’s primary election process, and criticisms over the legislative process. Nicole Nixon: We obviously want to touch on the ballot initiatives and the effect that they'll have on this session. Right now we know of at least one big plan to change Medicaid expansion to a version that was very similar to what the legislature passed last year. Voters rejected that when they approved Proposition 3 Medicaid expansion. Is the legislature really listening to voters when it floats proposals like this? Brad Wilson: There is discussion about how we implement Medicaid expansion which the state has to do or at least needs to look at after the voters passed it and we're going to I'm confident have coverage for everyone. So this narrative that we're going to go back to what we passed last year, that’s something the voters didn't want, at least if that's happening, I'm not aware of it. I'm not sure where that's coming from. Julia Ritchey: I think that was Sen. Allen Christensen's bill. It has some similarities to some of the things that the Medicaid bill did last year. But I think maybe speak more broadly to the concern that exists that the legislature is not your friend and is out to undercut, or revise, or do things to these ballot initiatives that would in some way negate the will of the people. BW: I understand the concern but I guess I would just say this: When you look at Prop 2, which was medical cannabis, that passed. There were some problems. We were going to have to come back in and fix some technical issues. The group that put it on the ballot initiative was involved in the compromise to fix some of the problems there and they feel really good about where we ended up. I believe we're going to have the best medical cannabis policy in the country. Medicaid expansion, I think, is a tremendous opportunity for us. I mean, quite frankly, it really helped that the voters said, "Raise our taxes to provide coverage for everyone." So the legislature is going to operate in that space. We're going to use that tax money. We're going to provide coverage for everyone. But here's the thing: the legislature has a constitutionally mandated responsibility to balance the budget every year. So we've got to kind of figure that out too. I think by the end of the session, people are going to be pretty happy with where that ended up. The ballot initiative process is a really important part of our democracy and it's something that has changed the landscape of this state, I think in many cases for good. But every year we pass 500 bills here; 350-400 of them are amending sections of code that need to be fixed or tweaked. And we'll continue to do that because the world we live in is changing and we'll have to keep doing that kind of work here. JR: So Governor Herbert does this thing every year where he says, "I want this amount of money but I'm not going to tell you how to do it." So this year it was air quality. "I want a hundred million dollars for air quality. I'm not going to tell you what types of things you should spend that money on." So I'm really curious would you commit to spending 100 million on air quality? And what are the things that would add up to that amount? Because that is quite a large amount of money. BW: Yeah, it caught everyone's attention and I think it is a number that should catch people's attention in the sense that it's a big challenge for us. Not to be too personal, but in my home, there’s five of us and two have asthma. The inversions, when they are full of unhealthy material, are hard, right? We don't like this. The air is so much cleaner than it was 30 years ago, but our awareness of its health effects is even greater. We can't get in front of this quick enough and we're putting a lot of resources and time in it. The last five years we've probably appropriated more money and passed more bills (than) in the 40 years prior in terms of air quality. A lot of the things we've done haven't really even been able to be implemented yet, so we're going to see we're getting better and better. With that said, if we could find a good use for that $100 million and we thought it was going to make a measurable difference I think you'd see a spend it really easily. I've had this conversation with the governor. I've been in a couple of meetings in the last few days with really, really great ideas on how we can move the needle on air quality, maybe even in a quick way. JR: Every year the Legislature pats itself on the back for this deliberative process and it's kind of slow sometimes and can be frustrating to people. But then we see in the last few weeks of the legislature some big bills rise up, maybe with larger fiscal notes attached -- I think the Inland Port is the one everyone points to last year. Number one, do you see a problem with that? And is there a way to change that so that bills are given the full amount of time and not rushed at the end? BW: You know, I will say this: I think that our process here works really well. We have one of the last citizen legislatures in the country. The benefit of having people that serve in this legislature having two feet in the real world is priceless. With that being said, I think there's always things we can do to improve and try to get things out maybe a little bit quicker. But the narrative that the inland port was not something that we talked about publicly for months – it's just not correct. I mean, I had meetings in this office with Salt Lake City officials months before the session began. There was a lot of work being done. Something like that takes a lot of different stakeholders and a lot of hard work. That is part of the process, you bring stakeholders in and you work with them. We ran an alcohol bill two years ago that had probably 20 different stakeholders involved. That bill didn't get released until two weeks before the session ended, but everyone – with maybe a few exceptions – really liked that bill. So that is just sort of the way the process works. Most of the time we can get stuff done sooner, but the end of the session does create some sense of urgency. Utah's Republican dominated Legislature can be a lonely place for a Democrat. That can be especially true for the only openly gay legislator. For six years, that person was Jim Dabakis representing Senate District 2.